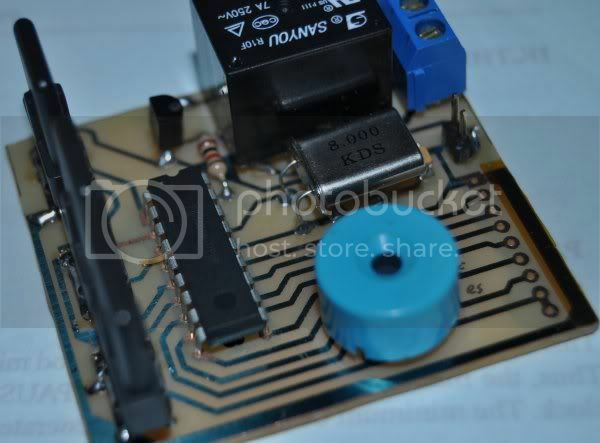 Há algum tempo que queria construir um temporizador para aplicar no meu processo de fabricação de PCBs, especificamente no controlo da lâmpada UV. For some time now i wanted to build a timer for my pcb making process, some specifically to control the UV lamp. Sempre que tenho placas de circuito impresso para construir, quando coloco os desenhos e a placa foto-sensivel tenho sempre comigo o telemóvel para cronometrar o tempo da exposição. Esse tempo precisa de ser controlado porque se estiver tempo a menos ou tempo a mais a placa vai ficar com defeitos. Isso implicava que estivesse sempre com o cronometro comigo e não podia esquecer-me de controlar o tempo. Desta forma criei um temporizador que irá controlar a lâmpada por mim. Everytime i have pcb boards to make, when i place the drawings and the photo-sensitive board under the UV light I always need to have my cell phone to count the time for the exposure. The duration that the UV lamp is on needs to be controlled because if it stays on less time that it’s needed or too long the pcb drawing will have defects. This means that, while the UV was on, I had to keep track of the time and never forget it. 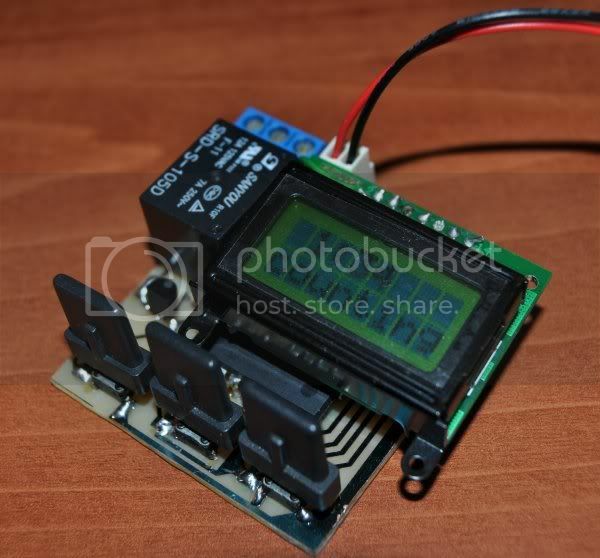 Because of that, I’ve designed my own timer ant it will turn off the UV lamp when the time right. Apesar de ter criado o temporizador fundamentalmente para controlar a lâmpada de UV, construi-o de forma a que fosse possivel dar-lhe outros usos. A base é simples, um microcontrolador que conta os minutos e segundos que pretendemos e mantem o relé activado durante esse tempo. Quando o tempo chega ao fim, o relé é desactivado e um pequeno piezo tocará. O pequeno display manterá toda a informação visivel. Although i made this timer to use with the UV light, I also made it so that it could be used in many other applications. The idea is simple, a microcontroller counts the minutes and seconds that we previously have set and keeps the relay on during that time. When the time reaches zero the relay turns off and the little piezo will make a sound indicating the time is up. The little display is enough to show us all the information. Coloquei 3 botões para ser possivel acessar a algumas funções programadas no microcontrolador. I’ve added 3 pushbuttons to access all functions of the program. O microcontrolador guarda em memória o ultimo tempo que inserido. No caso de eu o usar apenas para o controlo da lampada UV, o tempo será sempre o mesmo bastando apenas ligar/desligar o temporizador. Caso pretenda mudar o tempo, basta carregar na tecla da direita e entrará no modo de edição do tempo. O display mostrará o tempo no formato MMM:SS. As teclas da direita e esquerda mudam o número correspondente e a tecla do meio irá passando do digito mais significativo para o menos significativo. Programei de forma a que o tempo máximo possivel fosse de 299 minutos e 60 segundos. 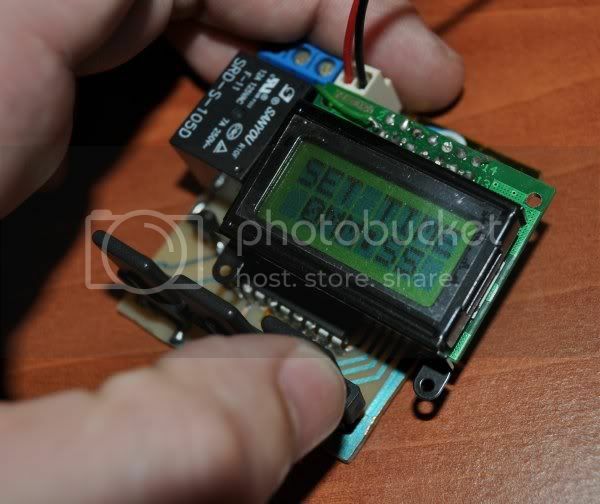 The microcontroller stores the last time entered in memory. For my UV application, the time will be always the same, so I don’t need to input the time twice, just turn it on and it’s ready. In case I do need to change the time, I just need to press the right button and it will enter the “set time mode”. 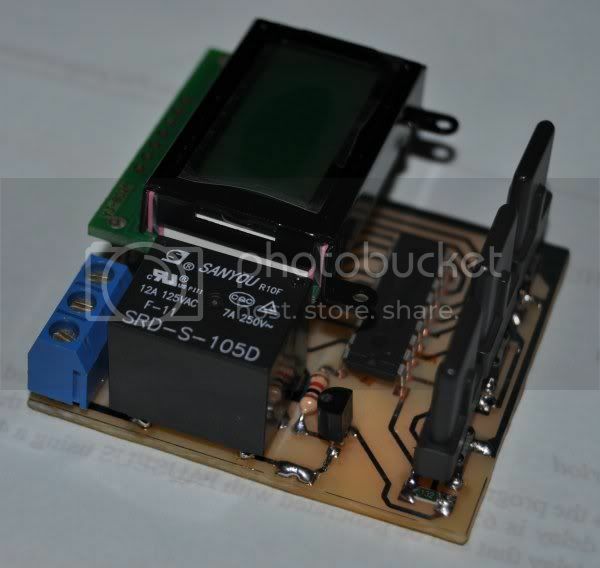 The display will show the time format as MMM:SS. The right and left buttons increase or decrease the number and the middle button will move to the next digit. I’ve programmed the microcontroller so that the biggest time possible would be 299 minutes and 60 seconds. Uma vez o tempo definido, pode dar-se inicio á contagem com um simples toque na tecla do centro. No final do tempo o piezo tocará, o relé desligar-se-á e o display indicará que o tempo terminou. Once the time has been set, the countdown can start just by pressing the middle button. 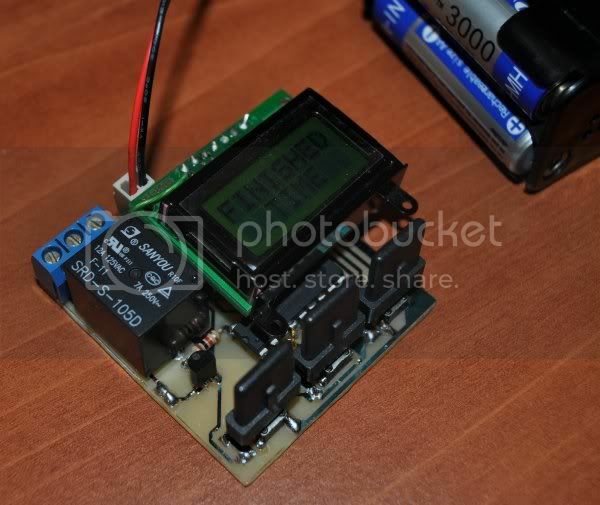 At the end the piezo will make a sound, the relay will be turned off and the display will indicate that the time is ended. O circuito é alimentado por 4 pilhas recarregáveis de 1.2V. Não construi nenhuma caixa porque irei instalá-lo na caixa de exposição onde já está a lâmpada UV. Four 1,2V rechargeable batteries are enough to power the circuit. I didn’t made any exterior box because I intent to assemble this circuit in my exposure box where the UV lights are in.